Really, climate policy would have been in a better place without Nick Stern. The Stern Review and the Fourth Assessment Report of the IPCC together seem to have silenced the public debate on the reality of the risks of climate change. We do not know which contributed more, but the Stern Review clearly put the economics of climate change in the public attention. Not that anyone noticed over here, or over here, or over there or even in never never take action land and certainly not anywhere near the wizard of denial and his acolytes. On the one hand, this is a good thing. Economists have a technocratic streak, and public scrutiny of their policy advice is absolutely necessary (Funtowicz and Ravetz, 1994; Funtowicz et al., 1998). On the other hand, successful emission reduction will require a global, century-long effort. The Stern Review enflamed rather than enlightened the discussion from which the effort will emerge. Where consensus is needed, controversy was flamed. This was true for the immediate aftermath of the publication of the Stern Review, and it may still be true. Eli is inclined to be not very nice on this point, as those who stirred the flames now find that they were wrong, as we shall see, not for the right reasons. Still they did get there, and publication in E&E brings this point home. The bottom line is the place Eli has been since he came up with Eli Rabett’s Simple Plan to Save the World. Let us hope that this is not the case for the future. Let us hope that Leonardt’s (2007) final observation from his day at Yale carries the day now that the dust is settling: “In other words, it’s time for a tax on carbon emissions”.Here is the beginning of my post. The numerical results reported in the Review are controversial and value-laden, but that is the nature of the economic science. In some instances, the controversy has been created by people who want to undermine confidence in the Review’s fundamental conclusion - the economics of climate policy tells us unambiguously that it is time to act. In other instances, the controversy can be attributed to economists being economists – arguing over every point to make sure that this fundamental conclusion is built on solid analytical and empirical ground. In both cases, unusually harsh words have been said about the Stern Review. We have participated in this discussion in large measure because we are convinced that the Review provides sufficient evidence to support its fundamental conclusion with very high confidence. We are, though, concerned that this confidence may not have been as influential as it could have been because the Review may be right for reasons for the wrong reasons. It is amusing to troll through the net searching for the kind words that YTM said about the Stern report when it was issued, especially in the light of this paper being written only four months afterwards. a. Climate is changing faster than was anticipated only 5 years ago in the Third Assessment Report of the IPCC (2001); indeed, the signs of human-induced climate change are now being observed. b. Significant climate impacts have been calibrated in terms of multiple metrics, and the thresholds of associated climate risk have been identified in terms of changes in global mean temperature; some of these metrics are economic, but many of them are not. 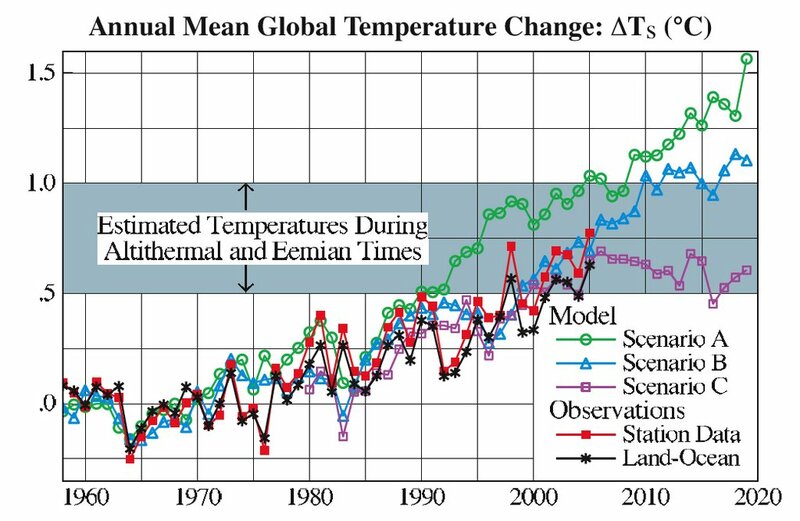 c. Many of the temperature thresholds for critical impacts are, regardless of the metric, now thought to be lower than anticipated only 5 years ago; it follows that we are approaching them more quickly than we thought, and so we will reach them sooner than we thought. The sharpening of the AR4 on these points with respect to the TAR and the Stern report answer Stoat’s question about why the AR4 makes Stern even more pessimistic about climate change then he was in Fall 2006. The next point is one the Pielke Jr. does not get, although it has been explained to him multiple times by multiple people, some even nicely, at least the first few times. d. Achieving any concentration threshold cannot guarantee that we will be able to keep increases in global mean temperature below any specific target; in fact, achieving a concentration target can only reduce the likelihood of keeping temperature increases below any target at any point in time in the future. e. Achieving any concentration threshold may, therefore, only delay inevitable increases in temperature unless persistent policy intervention over the entire century and perhaps beyond is undertaken.
. . . in terms of warming, are the basis for believing that the debate over the science of whether or not there is climate risk is over. To be more precise, while none of these thresholds is known with certainty, it is now impossible to argue that all of them are completely implausible. . . . While one may quibble about the precise numbers, their order of magnitude is not disputed. Of course, we have heard the roar of quibble from the denialist side. Our orphan ecomists, then make their argument for absolution without acknowledging their role aiding and abetting, even in stirring up. It is important to note in passing, however, that much of the controversy might have been avoided if the Review had been subject to a proper peer review before its release. This point was made by William Nordhaus at what was, in effect, a day long, public, and ex post peer review hosted by Yale University on February 15, 2007. The Stern author team admitted as much during that event, but they expressed concern that pre-publication review would have meant that bits of the Review would have been inappropriately leaked to the press. “buying insurance” against economic consequences of climate change and the economic consequences of rapidly ramping-up climate policy in the future. As soon they recognize that some sort of policy will be required . . .simple economics says that taking the least cost approach means starting now. This conclusion is true in large measure because atmospheric concentrations of greenhouse gases depend on cumulative emissions over time. As a result, achieving any targeted concentration limit (and thus a corresponding range of possible temperature increases and associated climate risks) is fundamentally an exhaustible resource problem. an initial price of carbon (or perhaps setting targeted permit price for a cap and trade system). This price should be designed to get the attention of the business community and to show political leadership in the face of a serious problem. It need not, however, be set so high that it would cause undue economic harm in the short-run. Allowing the carbon price to increase at the rate of interest year after year (following Hotelling) and acknowledging that adjustments for new knowledge about performance and risk will have to be accommodated over time will give the policy traction. Because the expected costs of adjusting to more pessimistic climate news sometime in the future if we delay taking action are higher than the expected costs of doing too much too soon (even with discounting at the market rate of interest).
. . . Since no policy created in 2007 will “solve the climate problem”, it is perhaps even desirable to step out from under that burden to confront a more manageable near-term problem while still making progress towards an ultimate response to an evolving understanding of climate risk. The answer to “What to do in the near-term?” is to design something that will (1) discourage long-term investments in energy, transportation, and construction that would lock in high carbon intensities for decades to come and (2) encourage development of alternative energy sources, carbon sequestration technologies and efficiency. Because natural gas is a considerably more expensive fuel than coal, it takes a substantial CO2 cost to overcome this fuel cost disadvantage – about $30/ton, on current fuel price expectations in the U.S. On the other hand, consider pending investments to add new generating capacity in the United States over the next few decades. Much of this capacity is currently planned as conventional coal-fired technology. What would it take, in terms of CO2 price, to make it economic to install new gas-fired capacity instead, thereby cutting by half the carbon emissions from this new capacity? On current gas price expectations, a CO2 price of only $5 per ton would be sufficient to make new gas-fired generators as economical as new coal-fired plants, based on the present value of fixed and variable costs. This number is much lower for new plants than the $30/ton seen above for existing plants because the lower cost of building a new gas plant compensates for some of its higher fuel cost. Providing a floor price of carbon to safeguard and encourage investments in lower emission technologies is a key and often lost point. Carbon taxes and cap and trade regimes are not punitive but mechanisms to drive investment toward lower emissions and eventually a carbon neutral economy. They make explicit the costs to the world of high carbon emissions. Time has passed so quickly that October 13, 1983 seems almost like yesterday. Yet higher education has been revolutionized during these 20 years. From being one of the most labor-intensive of human activities it has become a capital intensive industry. The revolution in higher education didn't just happen, it came from computers. It began with IBM's development of a computer that could read handwriting - any kind of handwriting, no matter how strange - and could translate half-formed, ungrammatical sentences and misspelled words into good English. Some innovative faculty members immediately thought of using one of these machines to grade blue books. It turned out that the machine could do the job more rapidly and much more cheaply than graduate teaching assistants, many of whom were promptly terminated. The next step came from the talking and listening, gully interactive computer developed by CDC for its PLATO programs early in 1992. This apparatus could give lectures and answer verbal questions from students; moreover, it could improvise professor type jokes during the lectures. It could also write equations and draw diagrams to illustrate what it was saying. Every now and ten, it would shoot a piece of chalk at a sleeping student. One enterprising chancellor - I believe he was at U.C. Irving - decided to appoint half a dozen of these machines to fill six faculty FTEs/ They were so successful and so inexpensive compared with faculty salaries (even though the initial cost was high) that soon every campus in the UC system had followed Irvine's lead. Of course there was a little trouble with the Academic Senate. The Committees on Academic Personnel refused to recommend several machines for promotion to tenure, but they were quickly overriden in the name of economy by the vice chancellors - except in UC Santa Cruz. During the past 10 years, the new machines have replaced all assistant professors. As tenured professors and associate professors retire, they too are being replaced by machines. The financial savings are enormous. In the last few years, an alarming new tendency has become evident. The students are also being replaced by machines. At first there was some question about whether machines could meet the admission requirements of the University of California, since none of them were high school graduates. But a few were admitted on an experimental basis, and all but one achieved a 4.0 grade point average. The one that didn't, turned out to be a defective Apple. "We mustn't let one bad Apple spoil the whole barrel," said the vice chancellor for Marine Affairs, as he threw the defective computer from the roof of Ritter Hall. Defenestratiing computers is something we all yearn for too frequently. Climate predictions shall have made great progress . . .(insert advertisement for Scripps) short term climate predictions shall become as much a part of society's operations as weather prediction is today. . . .
To be honest, Eli can accept people becoming a bit short with him, after all, he can be a mighty snarky bunny. OTOH Roger and his act like a two year old act and then do the whining for control bit has managed to light James Annan's fuse. So what more do the denialists want, good predictions of El Nino, flat decades and more out of a twenty year old model that you can run on a PC. What observations of the climate system to 2020 would be inconsistent (lets say at the 95% level of certainty) with the climate model projections of the IPCC AR4? It is a simple question. use global average surface temps from UKMET as the variable of interest if you'd like, since that is what we've been discussing, or use a different one. I'll be happy to post up your answer as a main entry of the blog. Would someone please ask what he is willing to pay per observation before we waste time. CO2 capture at the source (fossil fuel power plants, cement kilns) imposes a cost on the fossil fuel industry. Air capture is another Treasury Raid (as well as silly, work out the energy and materials cost). It also holds out hope that we don't have to do anything now, but that in 50-100 years air capture will save the world. SORT OF AN UPDATE: It's even worse. If you don the air capture true believer togs, then air capture makes even less sense because you could do better with less by picking off all the CO2 coming out of fossil fuel power plants and other fixed installations which, by itself would go a huge way, if not all the way to solving the problem. It's all so hummy. . .
And if you ever had to clean up after a sick bunny you will know that it takes a lot to make Tonstant Wabbit fwow up. Roger Jr is being all too twee again. Michael Tobis linked to the latest, and to give Benny Peiser his due, even Benny could not stomach the act. And by adaptation I don’t simply mean adaptation to the marginal impacts of human-caused climate change. . . I mean adaptation to climate, and as such, a concept much more closely related to the original notion of sustainable development. Unrestrained emissions of carbon dioxide into the atmosphere will no doubt have effects on the global earth system, including the oceans, atmosphere, and land surface. There is a chance that these effects could be relatively benign, but there is also a chance that the effects could be quite severe. I personally lean toward the latter view, but I recognize that there is ample scientific knowledge available for people to selectively construct any position they’d like along this spectrum. I have little expectation that climate scientists, despite their notable work alerting the world to the risks associated with unmitigated emissions, have much prospect for accurately predicting the evolution of the global climate system (and especially its regional manifestations) on the time scale on which decisions related to mitigation and adaptation need to be made. In fact, I think there is a very good chance that some enthusiastic climate modelers will overstretch their claims and hurt their own cause. Even so, I have concluded that it is only prudent to establish some cost to emitting carbon (a global carbon tax is the theoretical ideal). This paragraph is a huge ball of internal contradictions, but never mind. Clearly Roger doesn't agree with the IPCC reports, all three of them, which forecast that man is significantly affecting climate (WGI), that these changes are going to have very bad effects (WGII) and what is necessary to deal with this situation (WGIII). Benny pointed out that the cost of adaptation is not zero but at least 150 billion/year and that Roger is handwaving. But Roger is doing more than handwaving he is showcasing a basic denialist position (we don't really know enough to be certain of anything and certainly not enough to take action) while putting a fig leaf in place to defend himself later. The only reason he thinks taking action is necessary is because he personally thinks the effect of man made climate change could be severe, but in the preceding paragraph he said that the effects of man made climate change would be marginal. What is Roger adapting to? Roger:450, though likely not in the cards. 550-600 also unlikely. As you know I don’t think that this is the best way to frame the problem or think about action. It is a little like saying, would you prefer a poverty rate of 10% or 8%? Well, lower is better, the question is how do you get there? Not by arguing about ideal poverty rates I’d say. The stabilization rate we get will be the result of many individual policies justified on their own merits, not a top down target, which is exactly as policies are in fact developing around the US and elsewhere. The relax and enjoy it version of climate science **. 4) Poorly posed — adaptation will occur whatever the level of CO2 is - 950? Yes. 1500? Yes. Much adaptation is needed at 380 ppm. Adaptation and mitigation are not trade-offs but complements. Adaptation is needed at any levels of GHG concentrations. See our recent Nature piece. To answer your last question - at _no level_ is only adaptation sufficient. Clear enough? Now go stalk a carrot for a while. Which was as clear a statement on this issue as could be wished. Eli took a lot of abuse on your behalf, dear readers, to nail the liver mousse to the wall. Recently, Jon did the same. There's a lot of bluster in Boulder. When will this sink in? Ethon has been wondering about the recent push for more research before taking action on climate change. Of course, this is being lead by his favorite bag of munchies, Roger Pielke Jr. who insists, insists Eli tells you, that right now there is nothing we can do (well until paragraph 23) and blames the reporter for listening to him, gets the science all wrong on a paper in Nature to conclude that it's gonna get cold man, blames learning his science from newspapers, and generally has been trying to discredit anyone who thinks that climate change may be a major problem. Other players in the let's lie back enjoy it while paying for a lot of research that may or may not do anything school are our new friends from the Breakthrough Institute, Ted Nordhaus and Michael Schellenberger who are also playing the press like a squeeze box. As devoted readers of this blog and Naiomi Oreskes may know, this was exactly the tactic used by William Nierenberg in the 1980s to delay action on climate change. Nierenberg, Fred Seitz and Robert Jastrow founded the Marshall Institute at about that time, and all three were hip deep in driving climate change denialism. Nierenberg recruited a bunch of economist accomplices, William Nordhaus (Ted's uncle), Gary Yohe and Thomas Schelling. They minimized the threat, assumed the most favorable case and used the miracle of compound interest to set US policy as research but no action. Now Eli fully expects a great harumphing to emerge from the Breakthrough Institute/ Roger Pielke Jr./ Marshall Institute nexus, pointing to 23rd paragraphs where they say they really didn't mean it. “I’m amazed at how well-educated many Kansans are on issues about the environment and energy,” she said. As you may recall, Eli has a bet with Stoat on 2008 setting a new record for minimum Arctic sea ice. A small birdie who munches adaptive liver out in Boulder has passed the word that the odds are shifting in the Rabett's favor. 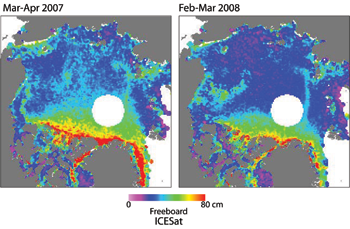 New University of Colorado at Boulder calculations indicate the record low minimum extent of sea ice across the Arctic last September has a three-in-five chance of being shattered again in 2008 because of continued warming temperatures and a preponderance of younger, thinner ice. The National Snow and Ice Data Center has an interesting map of the height of ice and snow above the sea surface from satellite measurements. This is roughly proportional to ice thickness.